Is Dubai's Museum of the Future the World's Most Complex Building? Dubai’s Museum of the Future, set to open in 2019, is a radical departure from the traditional skyscraper form. Courtesy Killa Design. Dubai is rightly famous for its modern glass-and-steel skyscrapers, such as the unparalleled Burj Khalifa. Yet no matter how sleek and tall you make it, a skyscraper is still a traditional building form, with its familiar repetitions and verticality. 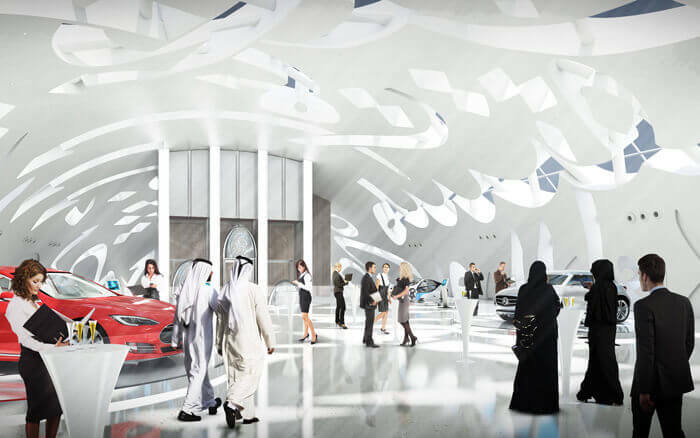 Dubai’s new Museum of the Future, however, takes a groundbreaking approach to architecture and what it means to be a museum. While there are certainly taller and more expansive buildings, this incredible feat of design, engineering, and construction will rank as one of the most complicated projects ever built. “A building with this complexity has never been done, not with this shape of the facade and the superstructure,” says Derek Bourke, BIM manager for construction firm BAM International. Designed by Killa Design and scheduled to open in 2019, the Museum of the Future will take a torus shape, a gleaming silver oval with an open center. The building looks almost like an eye keeping watch over this growing city, the largest in the United Arab Emirates (UAE). The museum’s futuristic facade will feature windows engineered into calligraphy forms. Courtesy Killa Design. 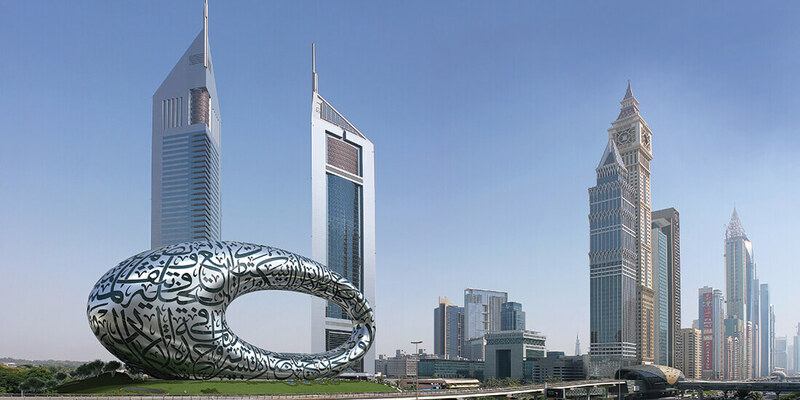 Art and metaphor were driving concepts in the museum design: The idea for the museum stemmed from His Highness Sheikh Mohammed bin Rashid Al Maktoum, vice president and prime minister of the UAE and ruler of Dubai, and it is intended to be an incubator for innovation and invention. (Its motto: “See the future, create the future.”) It’s not a typical museum, as in a repository of artifacts, but an active place to be filled with innovation facilities and design studios, a repository for ideas not yet conceived. It was important that the design be emblematic of the mission—a dazzling combination of art, engineering, and construction. 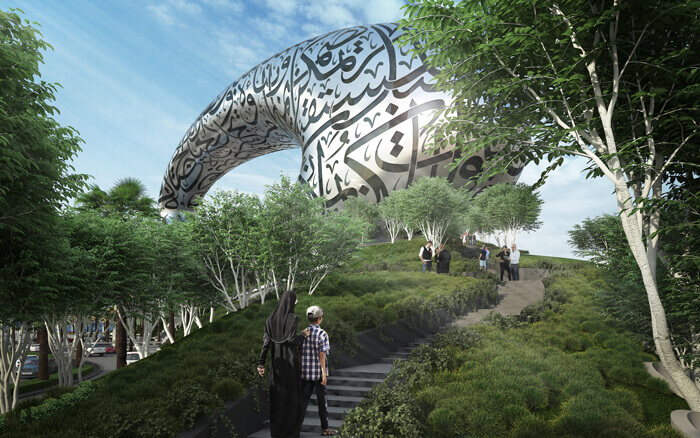 Art and poetry are manifest in the design of Dubai’s Museum of the Future, with Arabic calligraphy inscribed onto the exterior that features quotes from the prime minister about the future. But these “inscriptions” are in fact highly engineered windows, a dynamic blend of art and function. Exhibits will showcase futuristic technologies in various industries. Courtesy Killa Design. But design metaphors only take such a project so far. To ensure constructability and attain LEED Platinum status, Killa worked closely with BuroHappold for engineering services and BAM International for construction, employing 4D sequencing in BIM and reality capture for visualization. Once the team went into concept design, the entire process—all the way through to construction drawings and beyond—was designed and documented in Autodesk Revit. By designing with 3D models, the team could work through many potential conflicts in the structure, facade, and MEP (mechanical, engineering, and plumbing) systems. See how BIM helped the Museum of the Future Nab an AEC Excellence Award. In the past, such a futuristic design would have hit roadblocks as soon as it was put before the engineers or contractors. Now, the team could use software to create immersive visualizations, allowing collaborators to “walk through” the whole museum and check each element. Every potential clash could be detected on the deeply complex facade, in which the 3D calligraphy windows had to align correctly with the building’s unusual form, because overlaying a 2D calligraphy word onto a model would distort the word once it was applied to a 3D surface. “During any highly complex building, the architect and engineers have to work hand in hand,” Killa says. “There is no other way that you could produce such a building.” This collaborative process also allowed the team to achieve LEED Platinum through more than 50 sustainable-design decisions, including the use of recycled-content products, photovoltaics for energy, and internal-air recovery systems. The void in the center of the building, visible from the inside as well as the outside, represents the unknown. Courtesy Killa Design. The museum’s interior presented its own challenges. 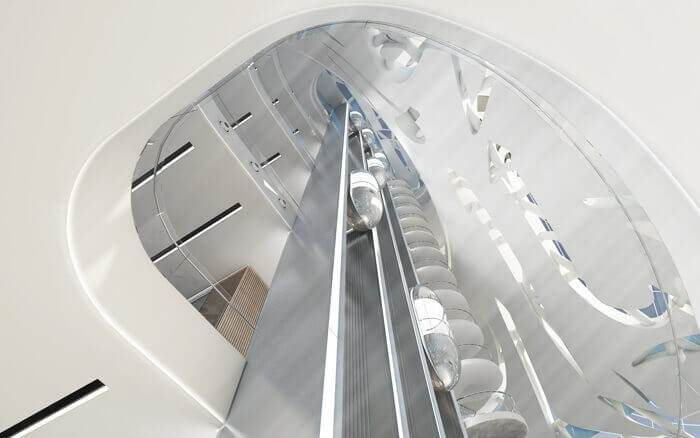 In particular, a freestanding, double-helix staircase required some deep manipulation of Revit to make a model that was understandable, Killa says. The idea for the stairway came from DNA.